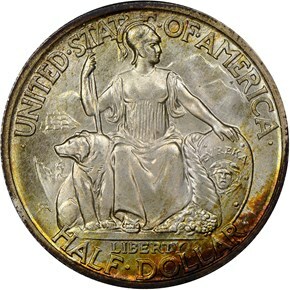 Accomplished and well-respected sculptor Robert Aitken, creator of both the Panama-Pacific fifty-dollar pieces and the Missouri Centennial Half, was selected to design and sculpt the coin. He clearly earned his reputation, as his original designs were wholeheartedly accepted by the Commission of Fine Arts, with the only change being the addition of the word LIBERTY. Today, the coin he designed is considered one of the most beautiful of the classic commemorative series. 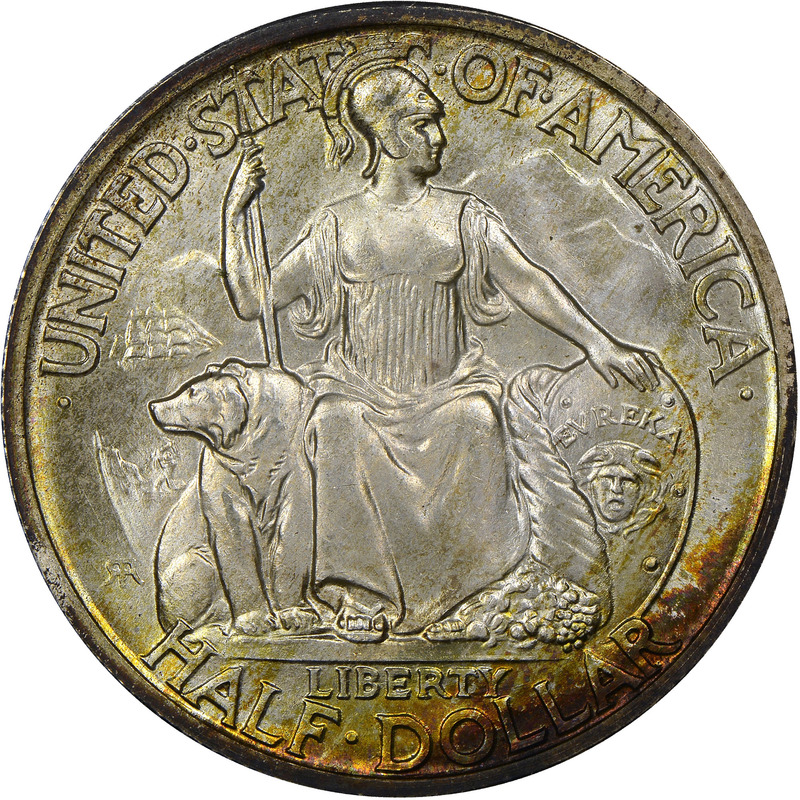 The obverse depicts the Roman goddess Minerva seated next to a grizzly bear and a shield emblazoned with the motto EUREKA. A tiny pickaxe-wielding minor as well as a square-rigged ship, both of which are adapted from the California state seal, can be found to the left. Arranged in an arc above this tableau is the legend •UNITED•STATES•OF•AMERICA• and below it is the value HALF•DOLLAR. Between Minerva’s base and the value is the motto LIBERTY. The reverse of the coin is dominated by two of the California Buildings at the exposition: the Chapel of St. Francis (with dome) and the California Tower. To the right is the date, and to the left is the name SAN DIEGO. Outside this border, arranged in a peripheral arc, is •CALIFORNIA•PACIFIC•INTERNATIONAL•EXPOSITION. 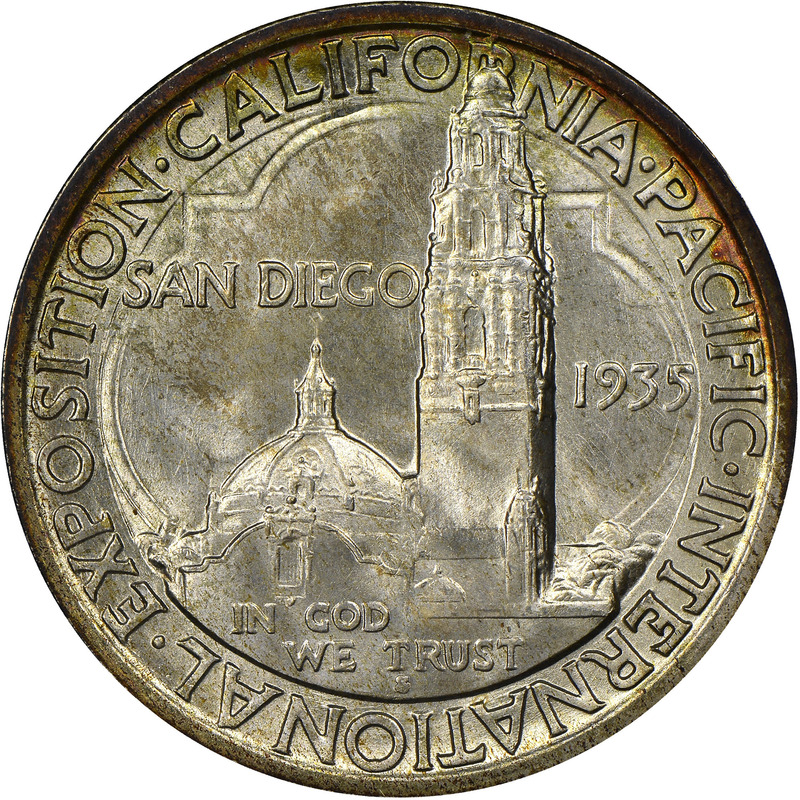 The progress of this issue was rapid, and only a month after approval of the design, 250,000 pieces were struck at the San Francisco Mint in August of 1935. By the 12th of that month, the coins were on sale at the exposition. While a decent number of coins were purchased by fair-goers, the committee expected the coins to be purchased in greater numbers by the coin collecting community. It soon became evident that sales would total in the tens, rather than hundreds, of thousands. Therefore, the committee went back to Congress, which authorized the melting and re-issue of 180,000 of the coins. These new, 1936-dated coins were struck at Denver. Klicka tried to raise the price from $1 to $1.50 to illicit more demand, but it was not to be. In the end, 150,000 of the newly struck Denver coins were also melted, leaving a total net mintage of 70,000 for the 1935-S and 30,000 for the 1936-D.